I REALLY slept in on the morning of our second day on the road. 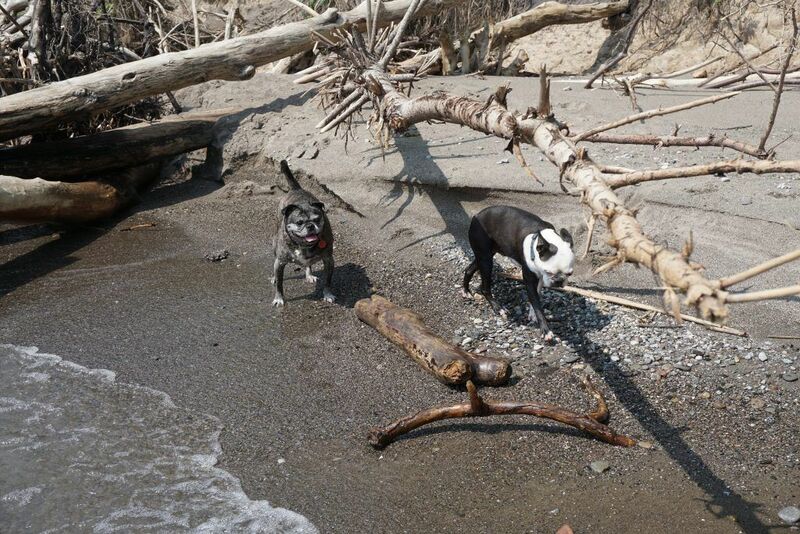 With no big rush to get going, I packed up our site and took the dogs to the beach. 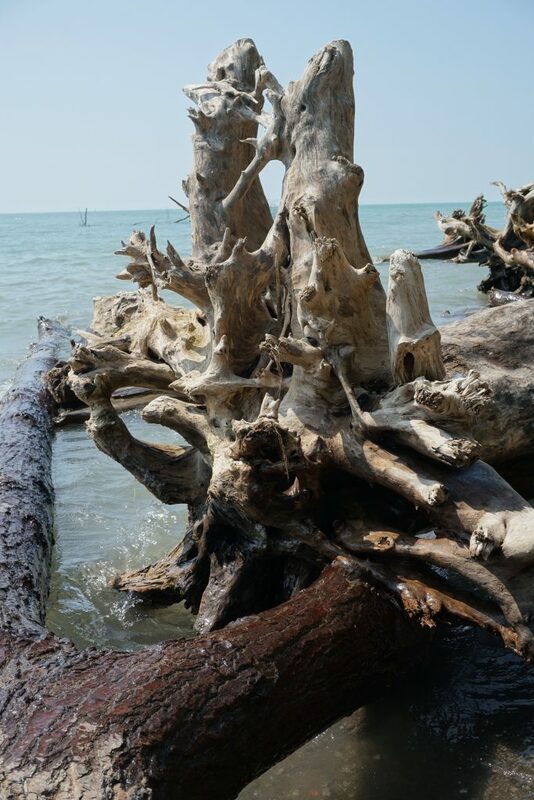 The heat was already building and there were already quite a few people cooling off in Lake Erie. 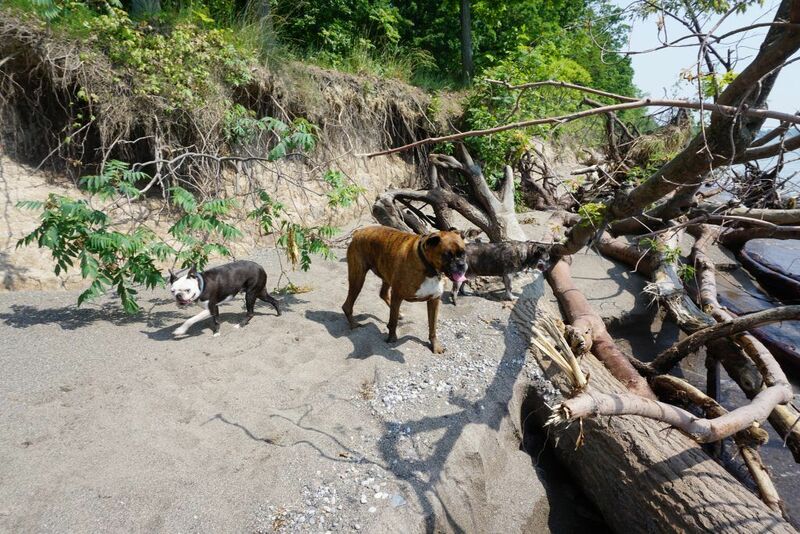 We headed in the opposite direction and found a pile of driftwood that would keep my pups from wandering. 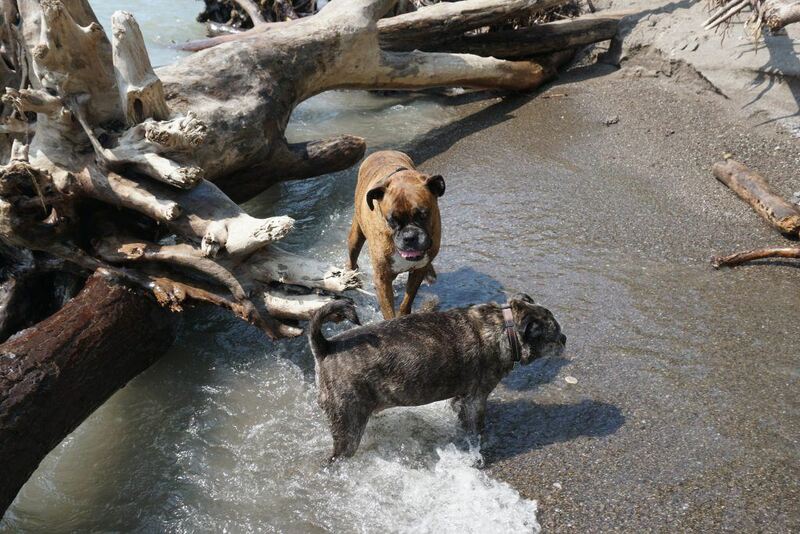 Once the dogs had tired themselves out in the water, we made our way back to the car and continued west. How’s that for a view to wake up to? We’ll just leave the people behind. Piper and Leo in the sand. I’m not sure why I liked the dried out roots. Make sure you get me from my good side. Jack taking a peek at the lake. 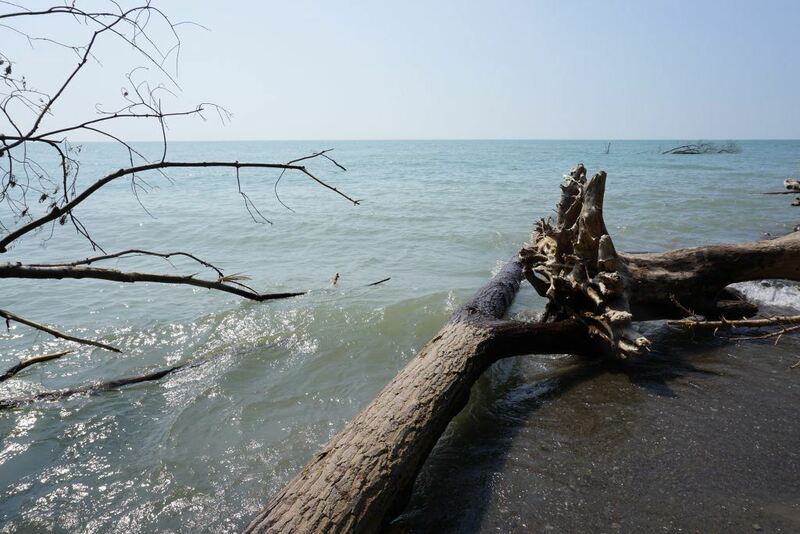 Fun fact: Lake Erie is the fourth largest of the Great Lakes and 11th largest globally. The folks in the background were having a laugh at my posing dogs. Birdie’s Perch was not what I expected. 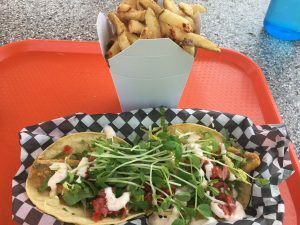 When I pulled into the lot, I found myself looking at an old double decker bus that had been converted into a food stand. Amazing. 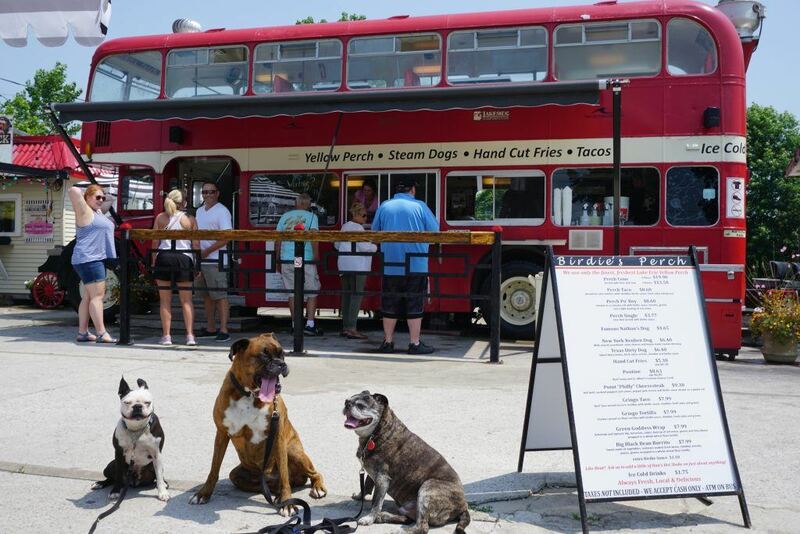 The dogs and I examined the menu board and settled on the perch tacos. Heck that’s what we were there for any way. We then claimed a table with the most amount of shade and sat down to enjoy the meal. The tacos were really good; so good that the dogs didn’t get any. After the obligatory photo, we were back in the car on on the road. Rather than take the direct route to the highway, we continued winding along the back roads until we got into Windsor. We made a quick stop in Windsor so the dogs could take care of business before the border crossing but they were practically wilting in the heat. Who am I kidding? So was I. As we waited in the line of vehicles at the border, I went through my pre-crossing checklist: passport open to photo page. Check. Dog documents. Check. Where am I going? Driving around Lake Erie and Lake Ontario. Why? Vacation. How long will you be away? I have to be back by next Sunday. Do I have any fresh fruits or vegetables? No. Ok. I got this. We rolled up to the booth and I handed my passport to the gentleman sitting inside. “Where are you going?” Driving around Lake Erie and Lake Ontario. “Purpose of your visit?” Vacation. Now he wasn’t exactly rude but he wasn’t exactly friendly. However after the interrogation that I had had in Sarnia I was quite happy to pass through with a less than friendly tone. Besides, I’d be a total miserable wreck sitting in that booth no matter what the weather. 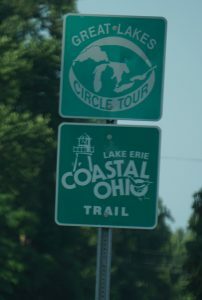 The Lake Erie portion of the Great Lakes Circle Tour is not well marked at all so I had to try and navigate by cobbling the route out so I have no idea how I ended up in a lot of places. Needless to say, the heat wasn’t letting up so the dogs mainly sat in the car while I drove with the AC on full blast. One of the rare wayfaring signs. 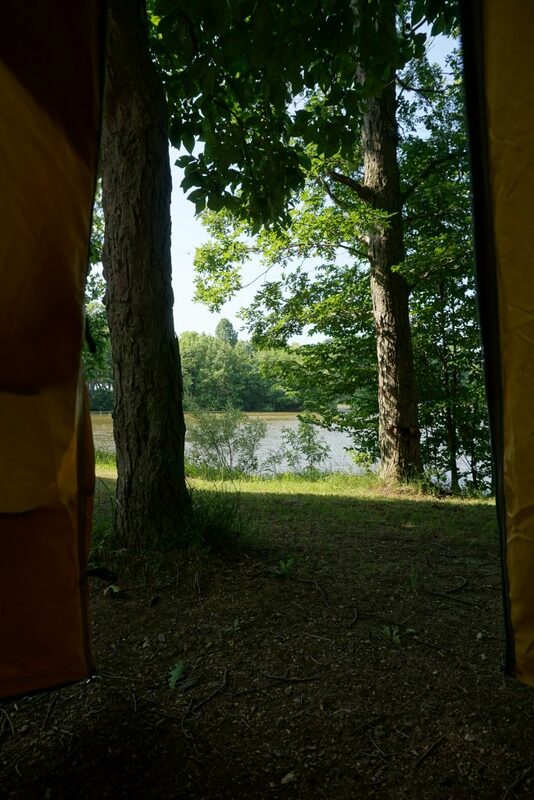 Around mid-afternoon, we had crossed into Ohio and it was time to start thinking about where we were going to spend the night so when I saw Maumee State Park, I thought that we had lucked out. I pulled up to the booth and snagged the last camp site available. 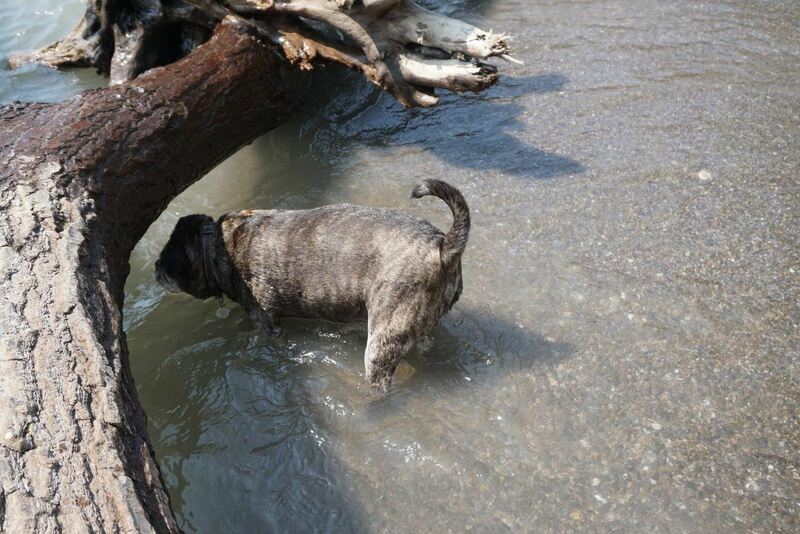 While the dogs were not allowed on the beach, they would be able to swim in one of the ponds. It all sounded good. We drove to our site and set up the tent. Our site had a good bit of privacy from thick stands of trees on three sides but the down side to that is that it blocked any breeze. Maybe this wasn’t such a good idea. I noticed that one of the tents in a nearby site had gotten around the problem of the heat by bringing an air conditioner. That’s right: a full-sized air conditioner. I have to admire the ingenuity and forethought that required. 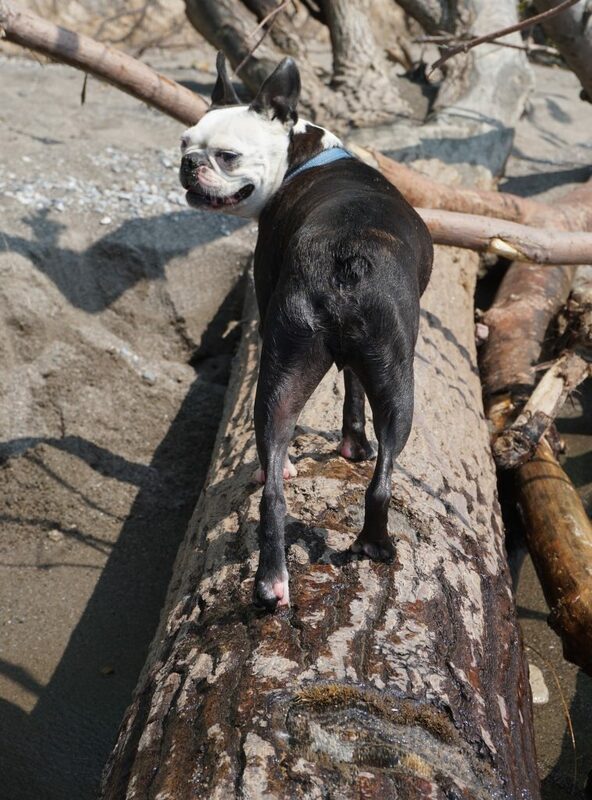 When I took the dogs to the pond, things went from not so great to even less great. At first the pond looked great but after the dogs crashed through the thick grass, I saw that the water was covered with a thick layer of algae and I was worried that it may be so stagnant that the dogs could get sick from it. When we got back to our site, the bugs had started to bite and the dogs were miserable. I have never seen Piper trying to get into the tent more than she was so we all climbed into the tent. Almost immediately it was hot. Even with all the windows and the fly open, it was stifling. I’m not sure why I didn’t just pack up right away but we went back to the staff to see if we could get at least some of our money back The supervisor was incredibly understanding and gave us a full refund which was amazing. So I drove us back to pack up the tent. I hadn’t even gotten the fly off before some other vehicle was skulking by on the road; they must have booked the site as soon as it became available. All in all, we were in Maumee State Park for about an hour. Fun fact: Ohio is the only state in the United States whose flag is a pennant design. 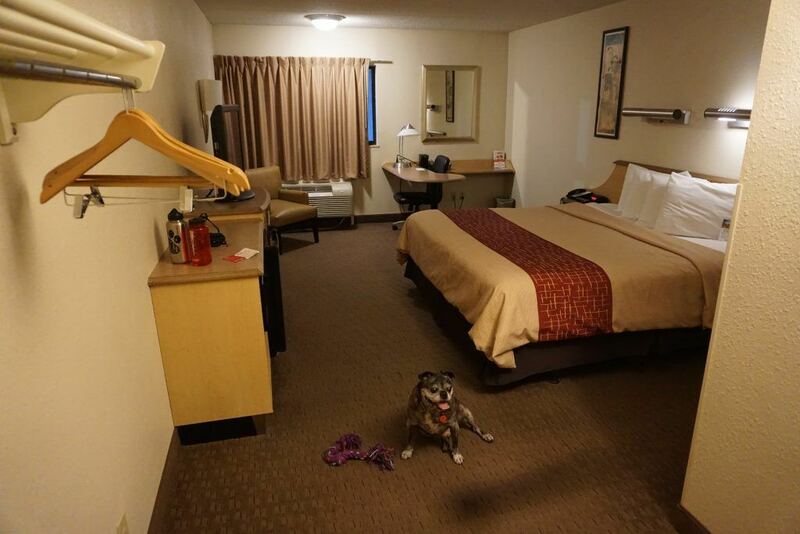 Moving along, it became apparent that the only option for us would be four walls and air conditioner for the night and the best bet to find that would be in Cleveland. We were happily driving that way, when I saw Toft’s Dairy Parlour which proudly proclaimed that it was Ohio’s oldest dairy. Well I had to stop to check that out. I parked the car and bounced out hoping to get something cold and refreshing but apparently I wasn’t the only one: the lineup to the counter was almost out the door. As soon as I saw that, I spun around and went back to the car. I would never wait that long for ice cream on principle, never mind when I have three dogs in the car. Sorry Toft’s, not this time. Luckily there is more than one purveyor of dairy delights and we found Romp’s Dairy Dock in Vermillion. I was a little selfish and ordered the Reese Cup flurry. Sorry dogs. On the plus side, there was a big park next to the lot so after I had finished my treat, we walked away from all the other people and I dropped their leashes to let them run. They didn’t run. They just looked at me and toddled along. It was starting to cool off a little but they wanted to get back into the cool car. It was starting to get dark when we pulled into the Red Roof Inn. Given the late start that morning, I was surprised at how exhausted I was. I was so tired in fact, that I didn’t even want to eat. I basically washed the travel grime off and fell into bed. Jack approves of the room. 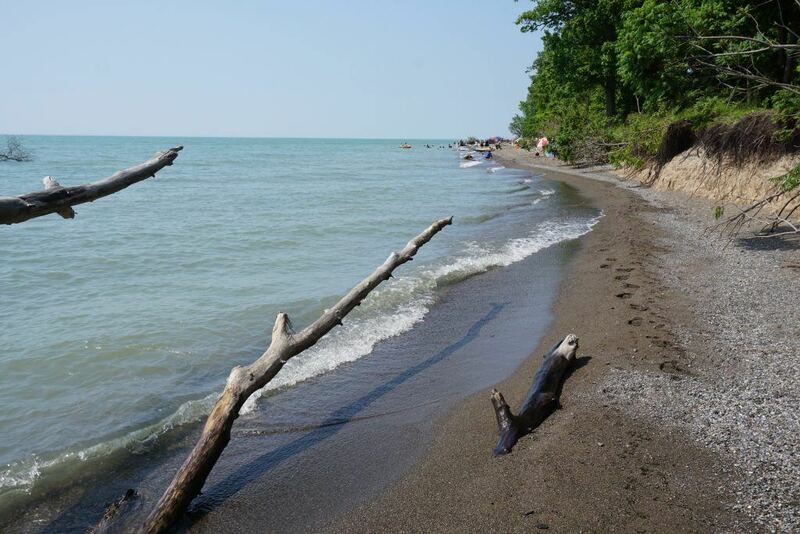 Did you miss the start of our tour around the Great Lakes? See how the whole adventure started here. 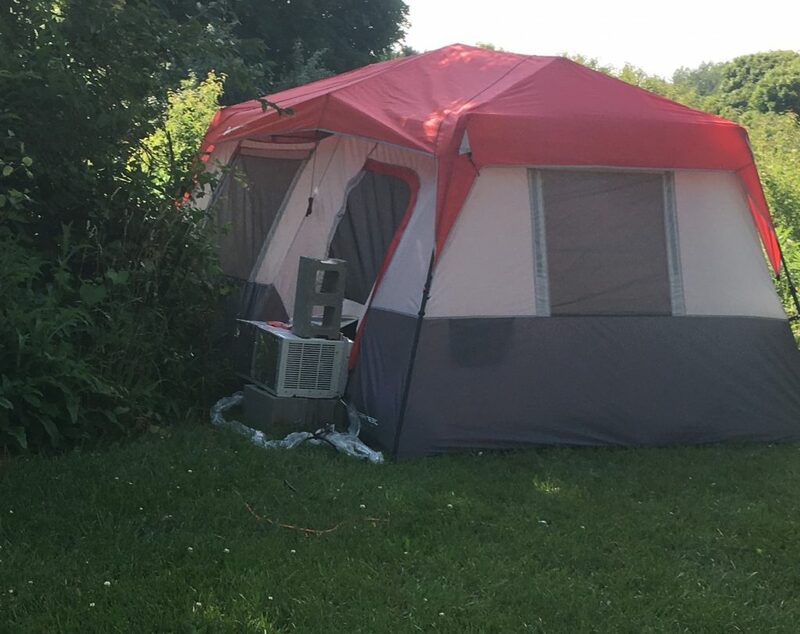 1 response to "The Great (Lakes) Escape – Melting Around Erie"
That air conditioner for the tent is hilarious and very ingenious!